The People's Guide 2015 36 Food Alhambra Sun. 8:30 am-1 pm 100 S. Monterey & E. Bay *Altadena Wed. 3-7pm 600 W. Palm Atwater Village Sun. 10 am-2pm 3250 Glendale Blvd., Wells Fargo lot Beverly Hills Sun. 9am-1pm 9300 Block of Civic Center Dr. Burbank Sat. 8 am-12:30 pm 3rd St./Orange Grove Ave., Cerritos Sat. 8 am-12 noon 17870 Park Plaza Dr., N. end of Per- forming Arts Center Parking lot *Compton Thurs. 11 am-4 pm Compton Blue Line Station *East LA Sat. 9 am-2 pm, 4801 E. 3rd El Seren Fri. 4pm-8pm Huntington Drive/ Maycrest *Gardena Sat. 8 am-1 pm. 13000 South Van Ness. Wed. 9am-1 pm. 1670 W. 162nd St. Glendale Thurs. 9:30am-1:30pm 100 Block North Brand Blvd. Hollywood Sun. 8 am-1 pm Ivar between Selma & Hollywood *Huntington Park Wed. 9:30am-1:30pm Salt Lake Park, Bissell/Florence Ave *Kaiser South Bay Wed. 10 am-3 pm 25825 S. Vermont Ave (corner of PCH) La Puente Thurs. 3-8 pm Martin Park Farmer's Markets That Accept CalFresh in LA County Long Beach Thurs. 3-6:30pm 46th St and Atlantic Ave * Long Beach Fri. 10 am- 4 pm 3rd and Pacific- on blue line station Downtown Long Beach Sun. 9 am-2 pm Alamitos Bay Marina * LA-Adams Wed. 2-6 pm 1432 W. Adams & Vermont (St. Agnes) *LA- Barnsdall Art Park Wed. 12 -6 pm Hollywood (Vermont and Edgemont) *LA-Central Avenue Thur. 12pm–5pm 4401 Central Ave. *LA- Crenshaw Sat. 10am-3pm 3650 M.L.K. Jr. Blvd. *LA- East Hollywood Thurs. 3:30-7:30pm Western & Hollywood Red Line Station *LA-Echo Park Fri. 3-7:30 pm Between Echo Park Avenue and Logan Street in City Parking Lot 663, just south of Sunset Blvd. *LA-La Cienega Thurs. 2-7 pm 1801 La Cienega Blvd. LA- OLD L.A. CFM Tue. 12pm-9pm North Figueroa St. / Avenue 58 LA-Pershing Square Wed. 9 am-1 pm LA- Vermont & 79th Sun. 10am-2pm LA-Veronon & McKinley Sat. 10 am-2 pm *LA-Watts Sat. 10 am-2 pm 103rd/Central LA- Wellington Square Sun. 9am-1pm 4394 Washington Blvd. *Mar Vista Sun. 9am-2pm Grandview/Venice Blvd *Monterey Park. Fri. 4 pm-8 pm 381 S Ramona Blvd near City Hall Norwalk Tue. 9am-1pm Alondra/Pioneer Pasadena Tue. 8:30am-12:30pm E. Villa & Garfield: Sat. 8:30 am-12:30 pm Sierra Madre & Paloma *Pomona Sat. 7:30-11:30 am Garey Ave. & Pearl San Dimas Wed. 4pm-8pm 245 E. Bonita Ave. *Santa Monica Sat. 8 am-1 pm Cloverfield & Pico Sun. 9:30 am-1 pm 2640 Main Street Santa Monica-Promenade Wed. 8:30 am- 1:30 pm and Sat. 8:30 am-1 pm South Gate Mon. 10am-3pm 4855 Tweedy Blvd. (inside parking lot at South Gate City Park) South Pasadena Thur. 4pm-8pm Meridian and El Centro Studio City Sun. 8am-1pm Between Laurel Cyn. Blvd./ Ventura Blvd Topanga Sun. 10am-2pm 6600 Topanga Blvd (indoors) *Valinda Thurs. 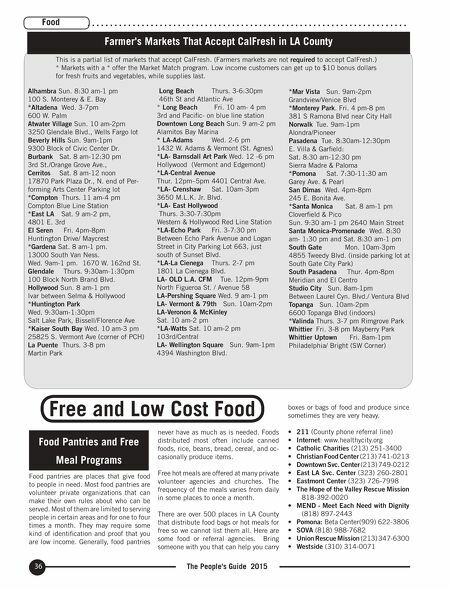 3-7 pm Rimgrove Park Whittier Fri. 3-8 pm Mayberry Park Whittier Uptown Fri. 8am-1pm Philadelphia/ Bright (SW Corner) Food Pantries and Free Meal Programs Food pantries are places that give food to people in need. Most food pantries are volunteer private organizations that can make their own rules about who can be served. Most of them are limited to serving people in certain areas and for one to four times a month. They may require some kind of identification and proof that you are low income. Generally, food pantries never have as much as is needed. Foods distributed most often include canned foods, rice, beans, bread, cereal, and oc- casionally produce items. Free hot meals are offered at many private volunteer agencies and churches. The frequency of the meals varies from daily in some places to once a month. 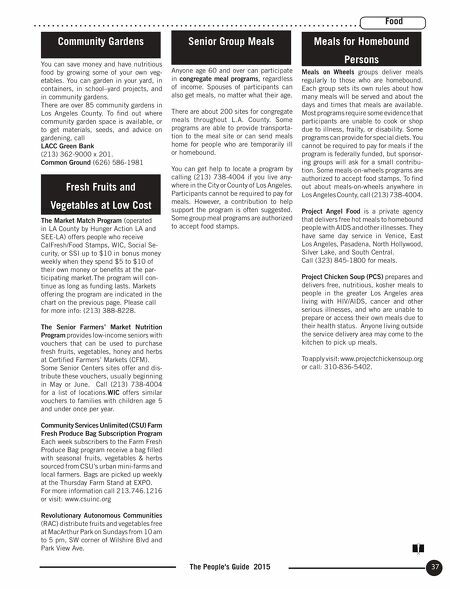 There are over 500 places in LA County that distribute food bags or hot meals for free so we cannot list them all. Here are some food or referral agencies. Bring someone with you that can help you carry boxes or bags of food and produce since sometimes they are very heavy. • 211 (County phone referral line) • Internet: www.healthycity.org • Catholic Charities (213) 251-3400 • Christian Food Center (213) 741-0213 • Downtown Svc. Center (213) 749-0212 • East LA Svc. Center (323) 260-2801 • Eastmont Center (323) 726-7998 • The Hope of the Valley Rescue Mission 818-392-0020 • MEND - Meet Each Need with Dignity (818) 897-2443 • Pomona: Beta Center(909) 622-3806 • SOVA (818) 988-7682 • Union Rescue Mission (213) 347-6300 • Westside (310) 314-0071 Free and Low Cost Food This is a partial list of markets that accept CalFresh. (Farmers markets are not required to accept CalFresh.) * Markets with a * offer the Market Match program. Low income customers can get up to $10 bonus dollars for fresh fruits and vegetables, while supplies last.